Published Online June 2009 in SciRes (http://www.SciRP.org/journal/eng/). levels of proposed GA considering accuracy and computational time. cost function corresp onding to each activity. 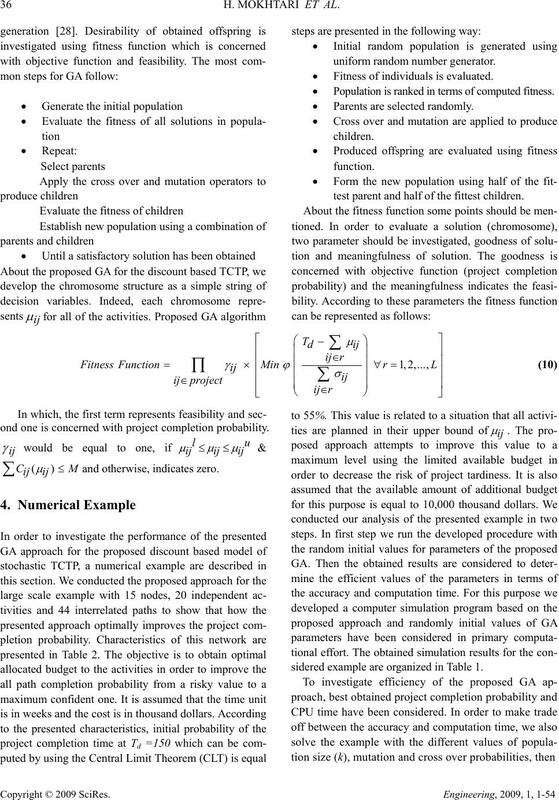 “Multi-mode trade-off problem in stochastic networks”. which activities are assumed to have three time estimates. 34 H. MOKHTA RI ET AL. sources allocated to the activities and their start times. 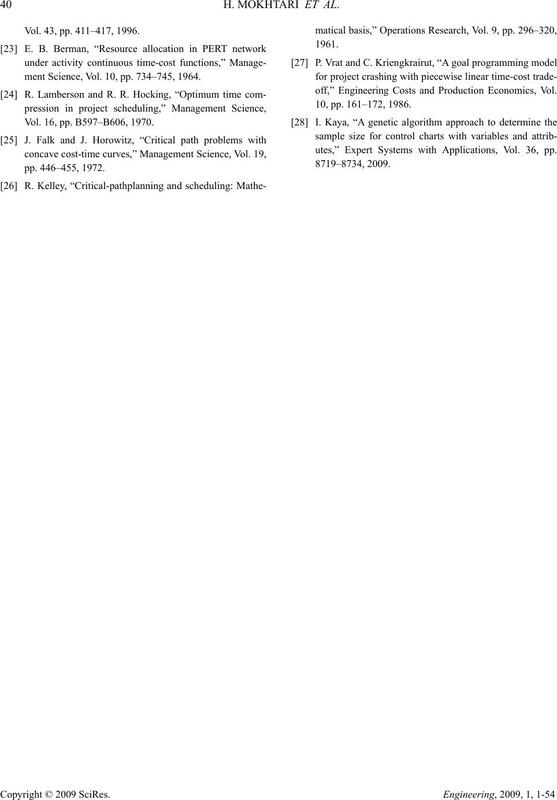 for the stochastic TCTP [11-14]. project PERT netw or k wi t h m nodes andn activities. Upper limit of mean of ith activity. Lower limit of mean of ith activity. Amount of available budget (i, j). 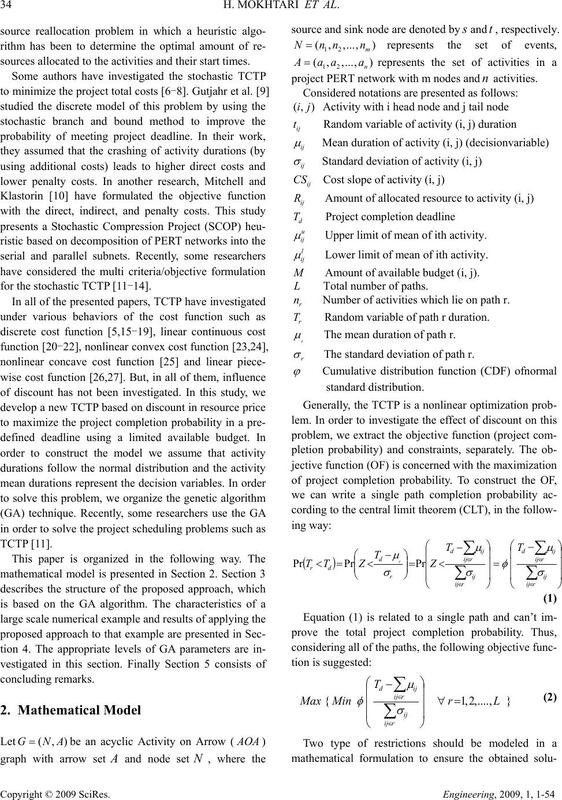 Number of activities which lie on path r.
Random variable of path r duration. The mean duration of path r.
The standard deviation of path r.
tions satisfy the budget limitation and real conditions. This is a new formulation of TCTP in PERT networks. 36 H. MOKHTA RI ET AL.  Fitness of individuals is evaluated.  Population is ranked in terms of computed fit ness.  Parents are selected randomly. test parent and half of the fittest children . ond one is concerned with project completion probability. sidered ex ample are organized in Table 1. Table 1. Characteristics of considered example. compute thecomputation time and efficiency measure. els of parameters, for presented example. levels of (k = 25). 38 H. MOKHTA RI ET AL. Table 4. 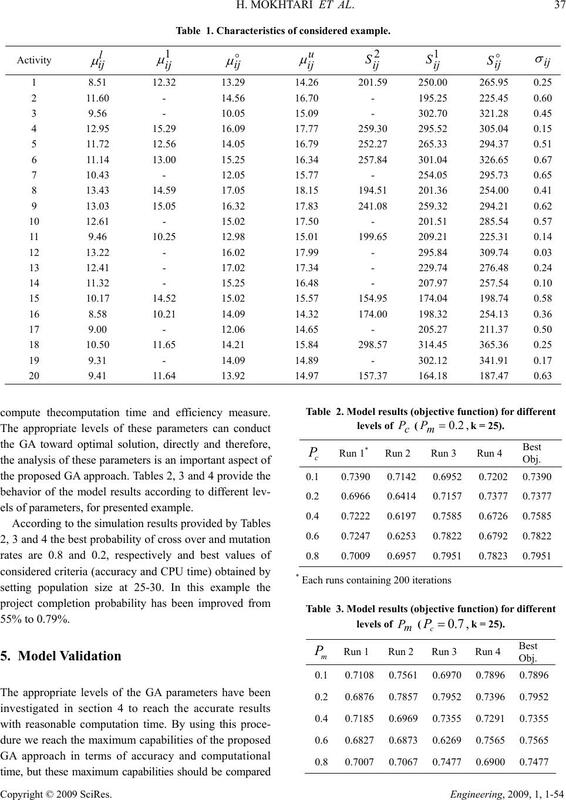 Model results (computational time, objective function) for different levels of k (). such problem by generalized reduced gradient (GRG). Table 5. 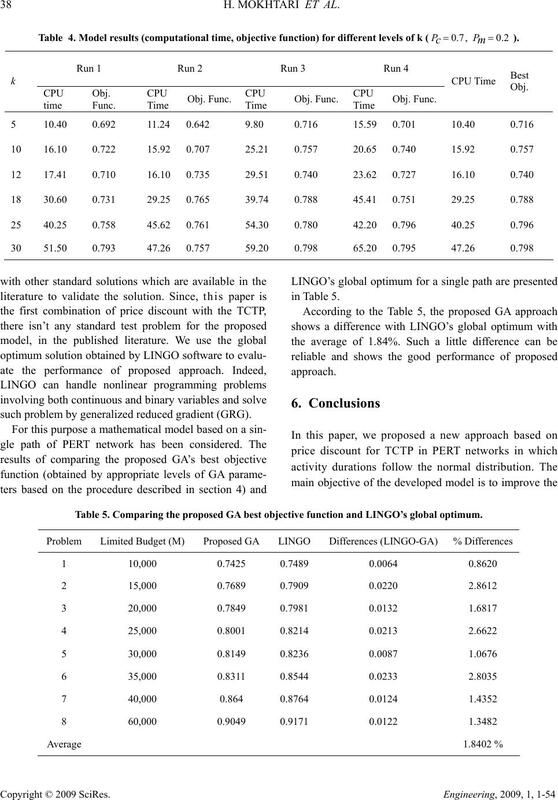 Comparing the proposed GA best objective function and LINGO’s global optimum. performance of the proposed solution approach. 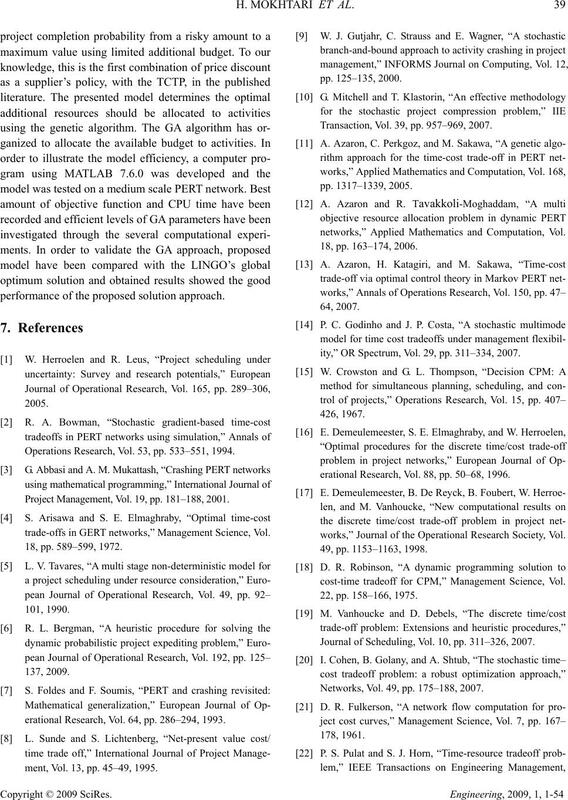 Operations Research, Vol. 53, pp. 533–551, 1994. Project Management, Vol. 19, pp. 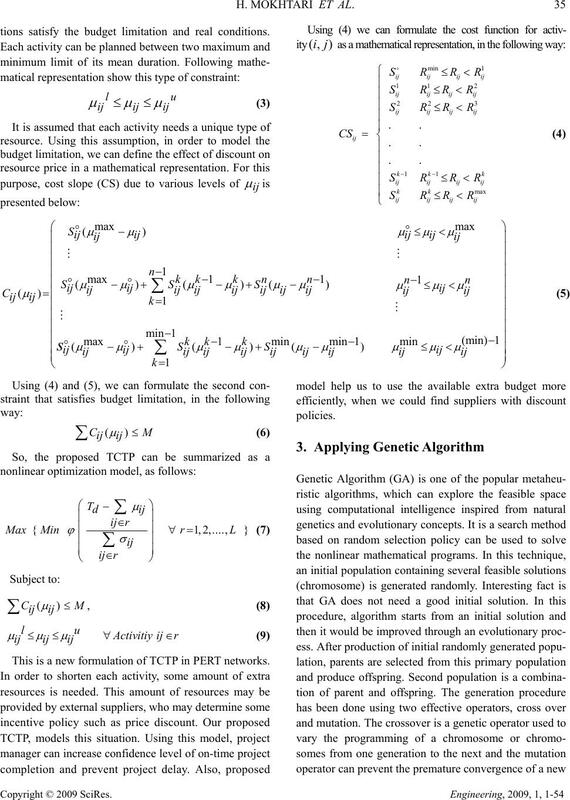 181–188, 2001.
trade-offs in GERT networks,” Management Science, Vol. erational Research, Vol. 64, pp. 286–294, 1993.
ment, Vol. 13, pp. 45–49, 1995. Transaction, Vol. 39, pp. 957–969, 2007.
networks,” Applied Mathematics and Computation, Vol. ity,” OR Spectrum, Vol. 29, pp. 311–334, 2007.
erational Research, Vol. 88, pp. 50–68, 1996.
works,” Journal of the Operational Research Society, Vol. 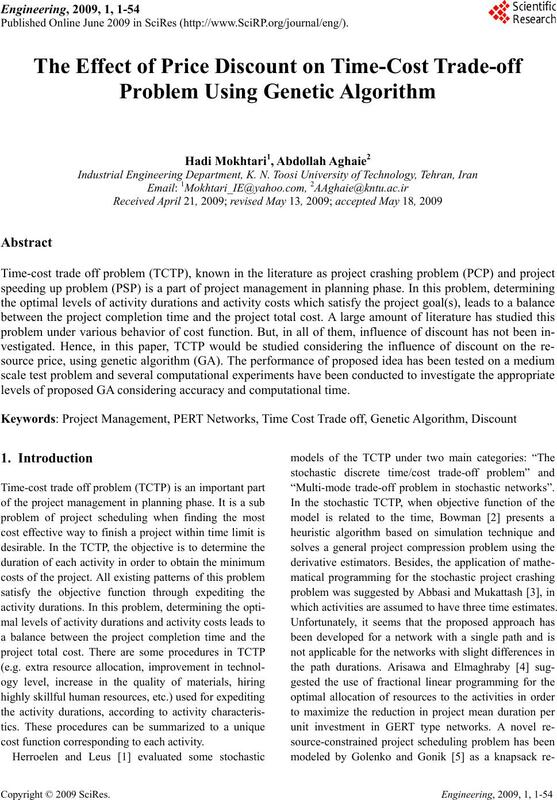 cost-time tradeoff for CPM,” Management Science, Vol. Journal of Scheduling, Vol. 10, pp. 311–326, 2007. Networks, Vol. 49, pp. 175–188, 2007. 40 H. MOKHTA RI ET AL. Vol. 43, pp. 411–417, 1996.
ment Science, Vol. 10, pp. 734–745, 1964. Vol. 16, pp. B597–B606, 1970.
off,” Engineering Costs and Production Economics, Vol. utes,” Expert Systems with Applications, Vol. 36, pp.